BENGALURU (March 6): Most Asian currencies edged up on Monday, after sharp falls last week as the dollar dipped on profit taking. Traders said an expected interest rate hike by the U.S. Federal Reserve next week was largely priced into markets already. The Taiwan dollar, which fell about 1% last week, was supported by gains in local equity markets as they rose more than a quarter of a percent. The Taiwan dollar was up 0.1% on the day at 30.987 per dollar. The Indonesian rupiah was up 0.2% on expectations of increased tax amnesty inflows, ahead of the month end dateline. The South Korean won was pressured by rising geo-political risks, after North Korea fired ballistic misslies early on Monday. Having risen by more than 1.5% over the past month, the dollar index, which measures the greenback against a basket of six major currencies, fell for a second consecutive day, as traders took profits ahead of the Fed meeting on March 14-15. Fed funds futures prices show traders see a roughly 80% chance of a rate increase this month, up from just a one in three chance early last week, according to CME Group's Fed Watch tool. "I don't see a lot of panic in the market today. With a March hike now completely priced in, today's price action suggests that further dollar upside is limited in the near term," said Stephen Innes, a senior trader at OANDA. China's yuan was little changed, after the government cut its growth target for this year to 6.5%, compared to last year's growth of 6.7%. Analysts said the decline was marginal and added that the government's focus on reforms was positive for the region. "The details from China suggest that any (economic) hard landing scenario is unlikely to materialise and they are serious about reforms and settling overcapacity and debt issues. 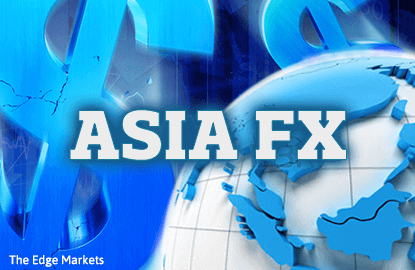 That is a positive for Asia as whole" said Roy Teo, senior FX strategist at ABN AMRO bank.